Yes, the Brother SE400 can embroider caps and hats with visors like baseball caps. 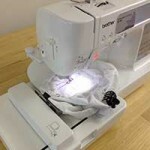 The trick is to hold the cap firmly in place while the machine embroiders it. A special cap hoop makes this job a lot easier. For a description of the cap hoop for the Brother SE400 and instructions on how to use it, read my post, Cap Hoop for Brother SE400 Embroidery Machine. I have a se400 brother, however I tend to get problems with tetrex materials when sewing buttonholes. The machine will start sewing then stop feeding.I guess the problem is the fabric, but how can I overcome this problem. things I want to do my machine says its too large for my hoop and its not even close I want to know how to change the size of the hoop in the machine so it will let me sew ? their has to be a way, otherwise why would they have 3 hoop sizes with it if it wouldn’t let you sew them. please let me know what I’m doing wrong. How can I emb. a name on a stocking cap? There is an existing design on the cap so I want to place a name above the design or on the back side of the part that folds up. I recently purchased a SE425. 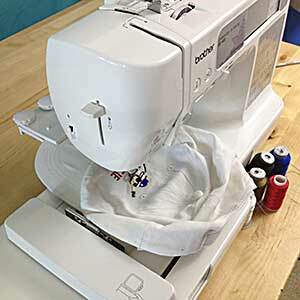 I designed an image on “Sew What,” I then transferred the image to the machine. It shows in the memory (40/476 kb) so I know its there, but it won’t let me select it. Any ideas? Hi Karen, it’s usually because the design is larger than 3.9×3.9 inches. See my tutorial and be sure to read the comments for other reasons. Hi! I am definitely thinking about purchasing a Brother SE400. I am making lanyards and wanted to embroider different designs on them. The width of fabric is about 7/8. Would I be able to do that if I put the fabric in the hoop? Or would I need a specialized hoop at all?